Day 5 of the 2nd round of Las Vegas burgers for Happy Meal and I took us to Landry's Seafood House. A lovely cocktail waitress had a strong opinion about the best cheeseburger in Las Vegas. She lit up when describing this particular burger. Her passion moved me to the point that I made Landry's our next trip. Besides, we weren't having a lot of luck finding burger greatness on this trip, and were becoming disheartened by a string of over-priced and under-delivering cheeseburgers. Landry's was across from the Palace Station Casino. It offered free parking in the attached lot. We were quickly seated. Our server brought out the chef once the questions started coming. We order a couple of the Landry's Gold Burgers. Our food arrived in about 15 minutes. 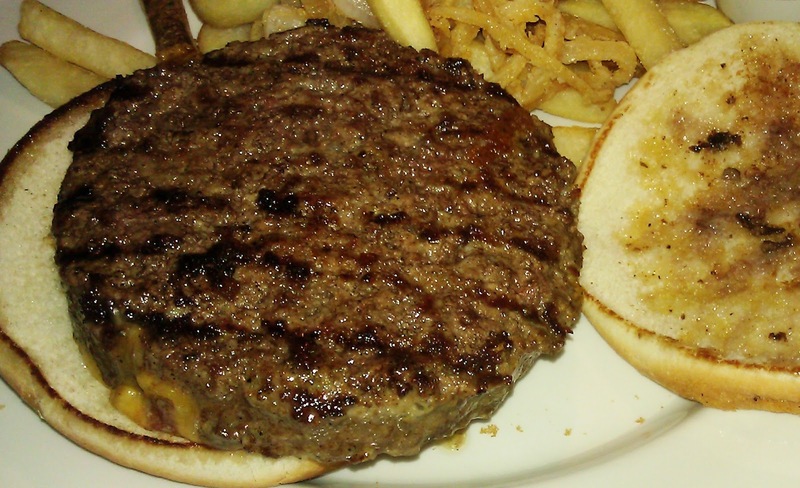 The Beef: Landry's Seafood House burger were comprised of 8 ounces of Certified Angus Chuck. Unlike P.J. Clarke's, where the Chuck was on the bland side, the Chuck in the Landry's Gold Burger was flavorful. the burger boasted strong, nearly heavy, beef notes. There was a satisfying note of funk from an aging process. The 80:20 burger meat was juicy to the point of nearly overwhelming the bun. The grind was medium, and the bite was firm yet yielding. The Seasoning: Yes! The kitchen at Landry's Seafood House hit the exterior of the uniform burger patties with a generous amount of salt and pepper. This seasoning caused the rich, beefy flavor to really pop. The result was a richly satisfying bite of beef. The Sear: The sear on the Landry's Gold Burger was not especially impressive on the non-cheese covered side, but it did provide a nice crunch around the edges of the patty. That coupled with the savory seasoning created a bacony effect...and everything is better with bacon. The Preparation: We ordered Medium--we got Medium. The burgers were seared on a properly hot, gas-fired grill. The patties were only turned once while cooking, and this allowed them to remain perfectly juicy. The 8-ounce patties were formed during the prep cycle. The beef was not over-manipulated during this process. The Cheese: Landry's topped our cheeseburgers with a generous portion of shredded, sharp, savory, Cheddar cheese. The shredded Cheddar was nicely melted. It added depth and complexity to the bite with its creaminess along with the notes of iron, salt, and tartness. The Bun: The bun was a generic, unseeded, standard burger bun. It was moderately sweet, fresh, a little yeasty, moist, and nicely toasted around the edges. The bun compressed perfectly. The bottom bun soaked up the copious burger juices with no capacity to spare. The Meat To Bun Ratio: This was perfect. The bun barely managed to contain the juicy patty. The Toppings: The shredded Iceberg lettuce was fresh and sweet. The tomato slice was hearty and ripe. The Fries: The peel-on fries were a frozen Sysco Foods product, but they were really quite good. The fries were crisp, perfectly salted, nicely browned, and rich with potato flavor. The fries were cooked in the same oil as the breaded shrimp, and this imparted a pleasant shrimp flavor. This was a good surprise! The Value: $9.99 for a 1/2-pound burger with a side of fries was a fair value considering the fact that Landry's Seafood House really delivered in terms of flavor and quality of preparation. The Landry's Gold Burger was the best burger that Happy Meal and I had sampled in Las Vegas on this trip. Landry's restored our faith in Las Vegas burgers. 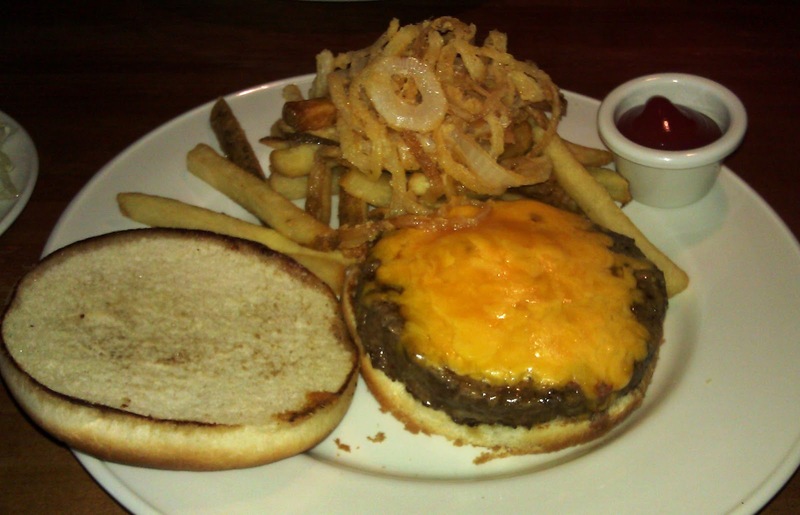 Burger Review : A really good and very cheesy cheeseburger at a fair price was enjoyed at Landry's Seafood House.